Caribbean Draw Poker is the latest entry in the Gold Series by Microgaming. 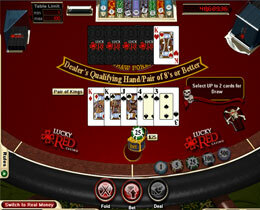 It is a table game variant where players may wager 2 bets per hand, and is played with a deck of 52 playing cards. It also features an optional Bonus in which a player may win the Progressive Jackpot worth $50,000 with a minimum wager of just $1. In this version, gamblers play against the dealer to see who can get the better five card poker hand. Gamblers must place their bets before the deal, and may even place side bets. These side bets afford players the opportunity to hit the Progressive Jackpot if they land up with a top hand. A Gambler will be dealt 5 cards facing upwards, while the dealer gets one card face up and four more, face down. At this point, players may now decide whether to Fold or Bet. If the players Folds he will lose the original bet, but if he Bets, the original bet will be doubled and the player will be given an opportunity to beat the dealer.